Drinking contaminated water - including accidentally swallowing a bit of water while swimming or wading. Giardia is present in many frontcountry and backcountry waterways. You should assume that all water you find is contaminated and needs to be treated. 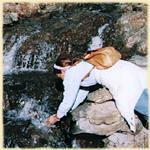 Pictures of sipping water from a cold mountain stream look nice, but are very risky. Visit Water Dude for lots more information about giardia and other water-borne contaminates and water treatment procedures. Symptoms normally begin from 1 to 2 weeks after infection. The symptoms continue for 2 to 6 weeks in otherwise healthy victims. Wash or peel all raw fruit and vegetables before eating. Use a water filter with a maximum absolute pore size of 1 micron or less. Boil the water for at least 1 minute at a full, rolling boil. Chemically treat the water with chlorine or iodine. There are several prescription drugs available to treat giardia. See your doctor if you think you may have contracted the parasite. He will probably have you submit stool samples for diagnosis. Drink plenty of uncontaminated water to replenish that being lost through diarrhea. How much iodine will treat mountain water against giardia? @Thais - iodine is not very effective against cysts like giardia. Manual filtration is better, or boiling. To chemically treat water, just follow the product instructions - using more won't necessarily work better or faster. (yea, like that) and not fun to deal with. If there was a silver lining, it's probably that I lost 10 pounds.